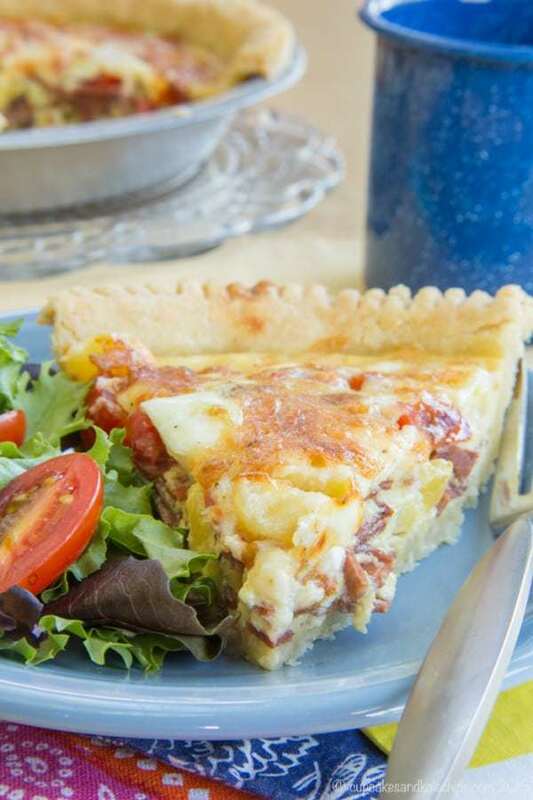 A salty and sweet nod to the classic Hawaiian pizza in a delicious breakfast or brunch recipe. 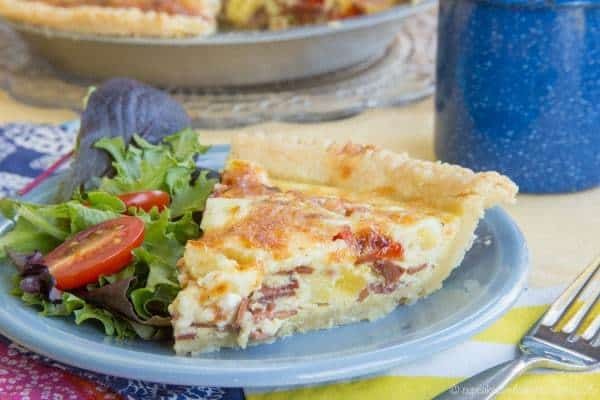 In a nod to the classic Hawaiian pizza, I added the sweet and salty combination of tomato, pineapple and bacon to a recipe perfect for breakfast, brunch, or my favorite, breakfast for dinner, and whipped up this Bacon Cheddar Quiche with Tomato and Pineapple. Disclaimer: I received products from Cabot Creamery Cooperative and King Arthur Flour. No other compensation was received, and I was under no obligation to write this post. 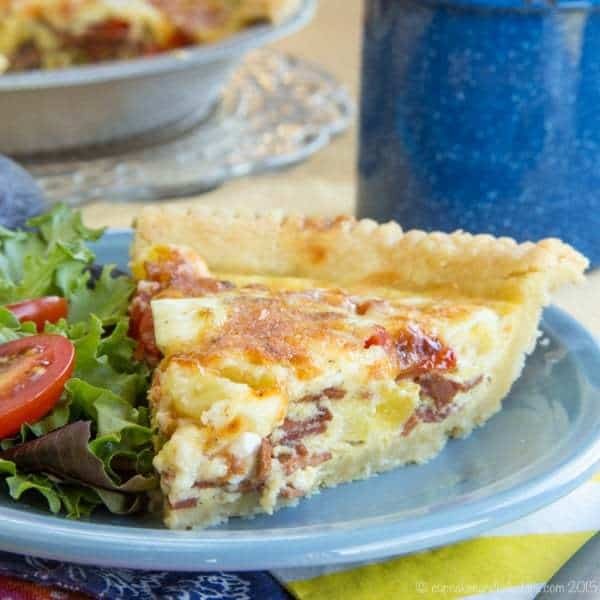 This post is an entry into their #QuicheFeast sweepstakes for a Cabot and King Arthur prize pack. As always, all opinions are my own. I’m feeling very conflicted. After school activities for Kindergarteners – talk to me people. The Bug has been taking karate since February, and while I know the benefits for physical activity and discipline and commitment, he wavers between disinterest, ambivalence, and excitement. With such a variation in his response to, “You have karate tonight!”, I have no idea what to really think. He has class twice a week. Plus religious education once a week. And on top of that, he doesn’t get off the bus till after 4:00. While he doesn’t have homework every night, somewhere in the midst of all of this, we need to fit in schoolwork, reading, playtime, family time. 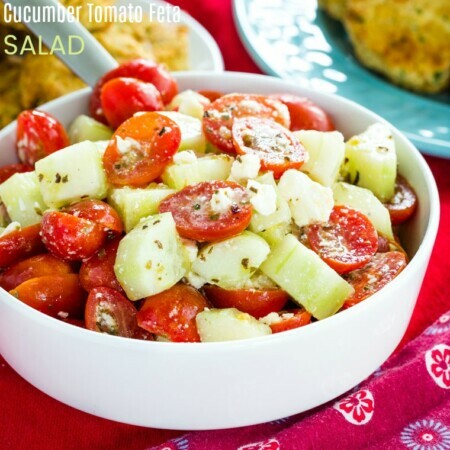 Oh, and let’s not forget dinner – both preparing and eating it. And somehow we have to manage to squeeze all of this in before 7:00, which is when we start bedtime. Now wait, there’s a reason for the early bedtime. Actually two. For some reason that I will never understand, my boys wake up around 5:30 am. The Bug’s bus doesn’t come till after 9, so mornings are looong. His days are even longer. And even though we head upstairs at 7, by the time we get through teeth and pajamas and prayers and stories, and the boys finally settle down (argh, two year olds! ), they aren’t sleeping till 8. Can you imagine what happens when we get a later start and not only do they refuse to shorten the routine but they are also even more tired, which often makes them crankier and makes it take even longer?! So on the nights with after school activities, the poor kids have literally no free time, and minimal time time spend with mommy and daddy. Which brings me back to karate – give it a break or just let the kid come home and play with his Star Wars figures and read with mommy? I have no idea. 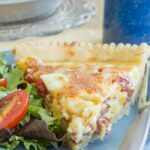 Bacon Cheddar Quiche with Tomato and Pineapple is inspired by my Hawaiian Scrambled Eggs, which was inspired by The Hubby and his buddy who used to make tomato, pineapple, and cheese omelets. 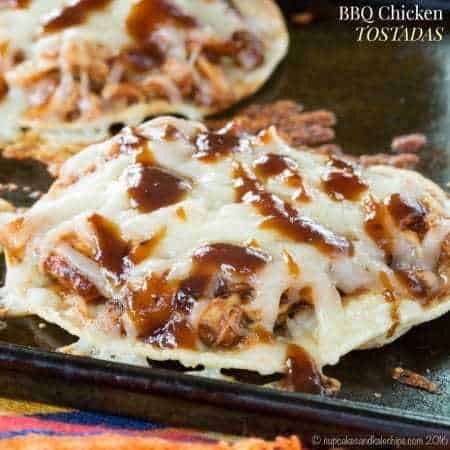 Sounds like a strange combination, but you’ve had Hawaiian pizza, right? 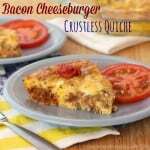 You know, tomato sauce, cheese, pineapple and ham or bacon or Canadian bacon. 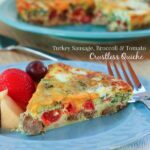 It’s a sweet and savory combination that is just perfect for breakfast, brunch, or breakfast for dinner, which is always a favorite meal in our house. The boys devoured this quiche, with Little Dude actually calling it pizza. Although any time I add Cabot Seriously Sharp Cheddar to anything, it’s always a hit. My boys have good taste in cheese. Also, I have to let you know that I am crust-impaired. My crusts are always too gummy or too crumbly or undercooked or overcooked, so I have typically stuck to pre-made pie crust. So I have been avoiding gluten free pie crust at all costs. Well, since the folks at Cabot and King Arthur Flour sent me the King Arthur Gluten Free Multi Purpose Flour, I had to try their gluten free pie crust recipe. You guys, so easy, so flaky, so perfect. I may be back in the pie crust game, even gluten free! What do you think about after school activities for elementary school kids? 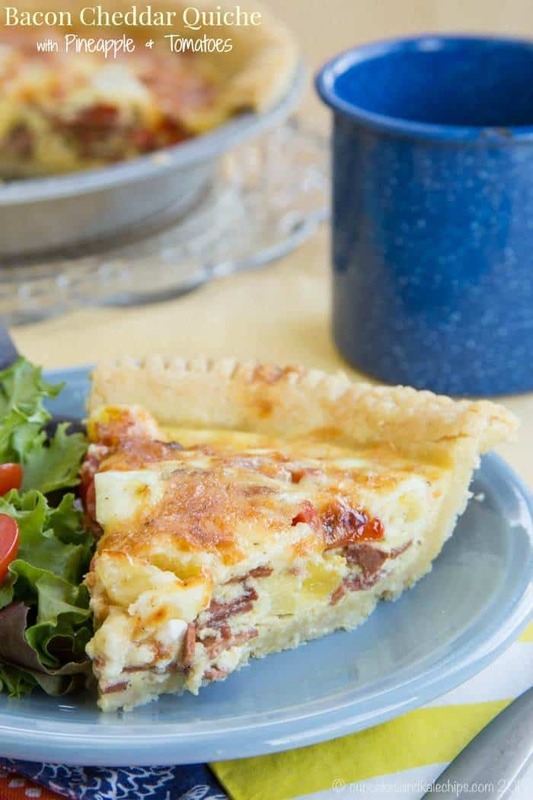 Sprinkle the bacon in an even layer in the pie crust, and top with tomato and pineapple. Top with the cheese, then pour the egg mixture over the top of the fillings in the crust. 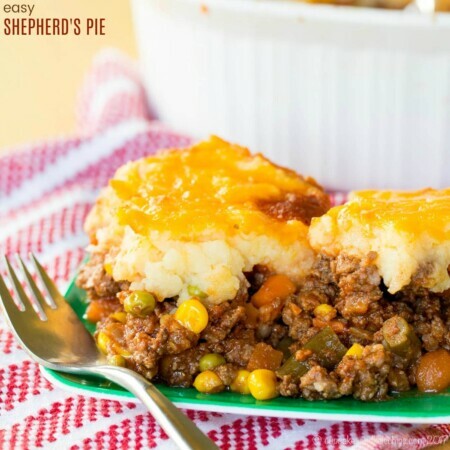 If you are using a glass pie pan, bake in the lower third of your oven so that the bottom, so that the bottom crust gets crisp before the edges get too browned. Bake for 30-35 minutes, or until crust is browned and the eggs are set. 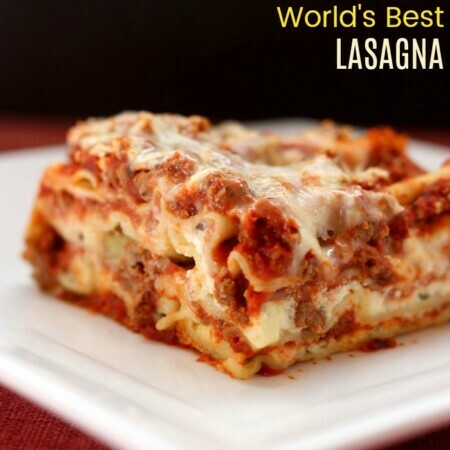 If the edges of the crust begin to brown too quickly, cover with small pieces of foil. Lightly grease a 9" pie pan (note: a metal pie pan is recommended. Whisk together the flour blend, xanthan gum, and salt. Sprinkle the cold butter pats over the flours and cut into the flour mixture with a pastry blender until its crumbly with some larger pea-sized chunks. Whisk the egg and vinegar together until very foamy. Mix egg mixture into the dry ingredients and stir until the mixture holds together. Add an additional 1 to 3 tablespoons cold water if necessary. Shape into a ball and chill for an hour, or up to overnight. Allow the dough to rest at room temperature for 10 to 15 minutes before rolling. Roll out the dough on a piece of plastic wrap or silicone mat that's been sprinkled with gluten-free flour until it's about an inch larger than the pie plate on all sides. Invert the crust into the prepared pie pan and press into the pan. Tuck in the edges, trim the excess, and crimp the edges. The little bits of pineapple giving it a surprising sweet salty taste that’s so good. Thanks Regan!